Known for its laid-back attitude, Grenada invites visitors to enjoy its slow-paced way of life. 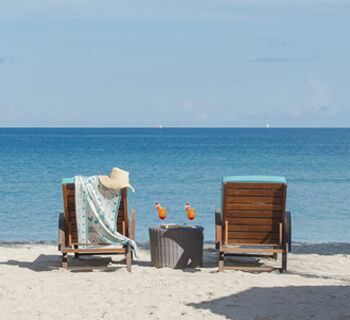 Whether you’re sunbathing on soft sands, reading a book while swinging in a hammock or swimming in warm waters, lazy beach days are always on the agenda. The lush flora and fauna found in the island’s interior, meanwhile, is best enjoyed with a leisurely stroll or safari. 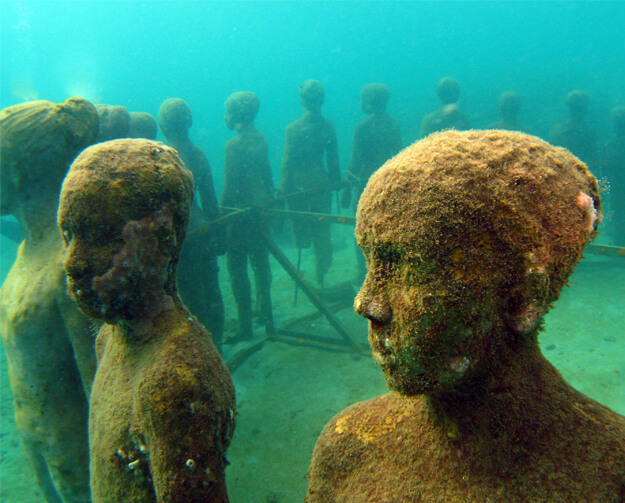 Near St. George’s in Molière Bay, you’ll find the fascinating underwater sculpture park founded by British artist, Jason de Caires Taylor. It features around 80 works of art and is accessible by snorkelers and divers or all abilities. Grenada is known as the ‘spice isle’ because of its many nutmeg plantations, but it also grows several varieties of fruits and vegetables. Visitors staying in luxury resorts in Grenada will have plenty of opportunity to sample these local ingredients, many of which are served with freshly caught seafood. Some of the island’s plantations are also open for tours. The main crop of Grenada is cocoa, and you can visit the Belmont Estate, a 300-year-old organic cocoa plantation, to walk through its landscaped gardens and enjoy a delicious lunch in the on-site restaurant. When it comes to eating out, you’ll find a wide variety of choice on offer, from street side stalls selling rustic local dishes at affordable prices, to fine dining restaurants with top chefs. Like most of the Caribbean, rum is Grenada’s favourite spirit and the island houses many distilleries. Enjoy a Carib - the island’s favourite beer - in one of the beach venues or sip a fruit-infused cocktail in a swanky hotel bar. Many of the people of Grenada are descended from African slaves who were brought to the island to work at the European-owned plantations. French and British influences are visible throughout the island, especially in the architecture, nodding to its colonial past. The island is home to a number of historical sites, including Fort Frederick, which was built by the French in 1779, and is the island’s best-preserved fort. There’s also Fort George in the capital city St. George’s, which offers panoramic views of the island and bay. Calypso and reggae are the most important musical styles in Grenada, while African culture has influenced many of the island’s traditional dances. 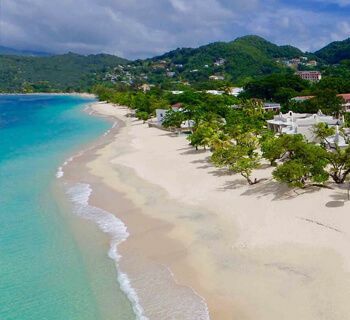 Azure offers a selection of luxury hotels in Grenada, where you can relax in stunning surroundings, admire the gorgeous views and take advantage of the private beaches. Whether you’re looking to pamper yourself in the hotel spas, relax by the pool or explore the nearby attractions and natural scenery, we’re dedicated to making your dream holiday become a reality. If you would like to find out more information about our bespoke holiday packages, please don’t hesitate to get in touch with our friendly and professional team by phone or live chat. A chic, laid-back boutique hotel, Mount Cinnamon is the perfect holiday destination for the discerning traveller. 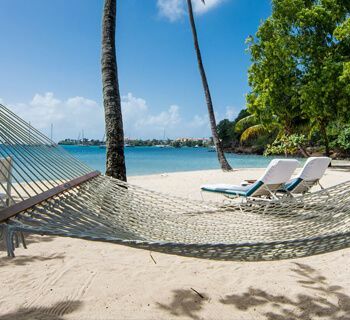 On the edge of Grenada’s tranquil Prickly Bay, you’ll find the traditional and charming Calabash Luxury Boutique Hotel & Spa. The hotel combines 5-star service with an intimate and relaxed atmosphere, and it’s also just a stone’s throw away from a pristine beach. Silversands in Grenada is a place where lavish facilities and natural beauty combine to create a truly unforgettable holiday experience. 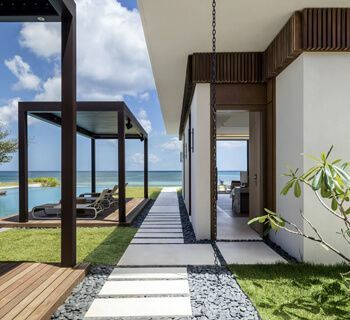 Newly opened in 2018, this stunning hotel invites guests to enjoy self-contained villas, state-of-the-art amenities and picture-perfect tropical scenery.